You still look for the pillow that will help you to get the sweet & better sleep? This new generation designed Meiz pregnancy pillow is great for mothers to be or those who suffer from upper body pain, joint pain, leg swell and back pain when sleeping. It's designed to cradle your body and help you enjoy a restful and relaxing night's sleep. Meiz struggle to make every customer satisfied ,therefore,this total body pillow improving on the smoothness and extra long size according to customer suggestions.Effectively offering the improvement of your blood circulation all night long and releasing your body pressure.So,if you'd like to sleep more deeply, the cradling comfort and gentle support of this premium pillow can make it happen! 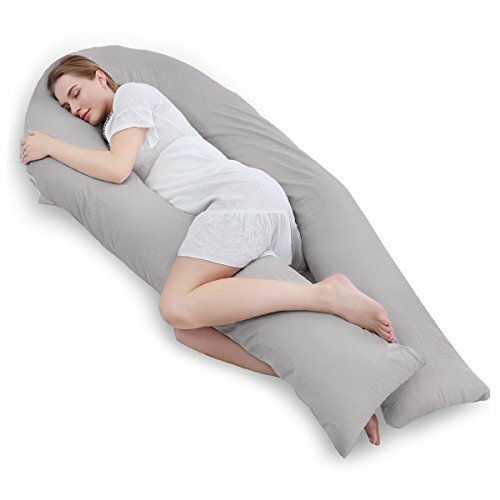 Click ""Add to Cart"" button right now to get amazing full body maternity pillow that promises your family, your friends and yourself more comfortable while sleeping! PREMIUM FILLING MATERIAL - Filling: This extra soft, adjustable and scent free 7 D hollow fiber filling, provides comfort for side sleeping and retains fluffiness for better performance and longer use. Inner Cover: Flowered brushed fabric looks more elegant with your furniture. Outer Cover: This comfy cotton cover with double zippers is hypoallergenic and machine washable. NO MORE SCRATCHINESS WITH SUPERIOR SIZE - Meiz struggles to make every customer satisfied, therefore, using technology from Denmark, this body pillow is a 100% improvement on the last model. It was improved on the smoothness and extra-long size, according to customer suggestions. Zero uncomfortable when skin is close to the pillow.360°total body support for a pain and sweet sleep. DEEPLY SLEEP EVERY NIGHT - To alleviate your fatigue and improve mothers' sleeping quality throughout your pregnancy. Customers used this therapeutic pillow to effectively relieve their joint pain, leg swelling and back pain. Helps keep your hip and spine in a neutral position. Ideal for sciatica and it also prevent malposition, hypertension syndrome and relieves pressure on the liver. IT is a great gift for expecting mothers. MORE THAN JUST A PILLOW FOR PREGNANT WOMEN - This maternity body pillow creates a belly support position for reading, watching TV, breastfeeding, etc. Though our pillow was crafted for pregnant mothers, it is also super comfortable for ANYONE who is needing more support, recovering from surgery, or tired of having to use separate pillows to support their head, back, belly, knees, hip, and feet properly! 100% CUSTOMER SATISFIED - We provide a 30-day refund GUARANTEE for manufacturing defects and if you are not satisfied with the maternity pillow. No questions asked! Customer satisfaction is our top priority. If you have any questions about this product by Meiz, contact us by completing and submitting the form below. If you are looking for a specif part number, please include it with your message.